Billing Consideration: Based on your feedback, we have now added a new domain suspension warning email if your monthly or annual billing fails for any reason. Domain admins would receive a daily email reminder upto a max of 7 days from your billing date. This has been done to give domain admins an opportunity to rectify your account billing details without causing any disruption of service to you or your users. At the end of the grace period of 7 days if the billing still fails, your domain would get suspended and all users would loose access to Office Chat. We hope the domain admins find this change useful and are able to address any credit card / billing related changes during the grace period and get a disruption-free service for their organization. New Tabbed UI & Actions In Header: This release of Office Chat comes with a new tabbed-ui on the desktop & mac clients giving you a cleaner & clearer access to chats, co-workers & groups. The actions UI on the header has also been updated to make it easier to add new users and get live-chat support whenever you need. Quick Access To Admin Portal: Domain admins now have direct access (with single sign-on) from their desktop & mac clients to the admin portal to manage users and the account. Signup Of New Users Into Your Domain: As domain admins you have full control over who can add new users to your domain; domain admins only or any existing user. If a user who has received an invitation from your domain, still tries to signup again he will now be presented with your company URL to login into. This is done so that users invited in your company domain, don’t end up creating new a domain and as a result aren’t able to message each other. Login Of Existing Users Into Your Domain: Users who are part of multiple office chat domains, will now be presented with a list of domain URLs when they enter their email address. They can then pick the domain from the list and then login. Share Your Video & Audio Updates: You can stay connected with your team when you’re apart with daily video updates and regular feedback using the new “Talk” feature on Office Chat iOS and Android clients. The talk feature is available in both private and group chats. General Improvements in Video: Faster availability of converted videos on receiver side with improved streaming using Apple’s HLS protocol. Improved Rendering of Rich Media in IM Bar: With this release, the IM bar in the web browser renders and plays the video, audio, GIF and images inline with the option to open the rich media in full screen. This improvement is available in both private and group chats. Login Of Existing Users Into Your Domain: Users who are part of multiple office chat domains, will now be presented with a list of domain URLs when they enter their email address on the “Login” window on www.officechat.com. They can then pick the domain from the list and then login. When a group name contains a special character (i.e., characters other than A-Z, 0-9), it used to crash the Mac client. This has been fixed. Custom status having a URL with a space caused the client to crash has been fixed. At time scrolling in chat view resulted in the client to crash has been fixed. 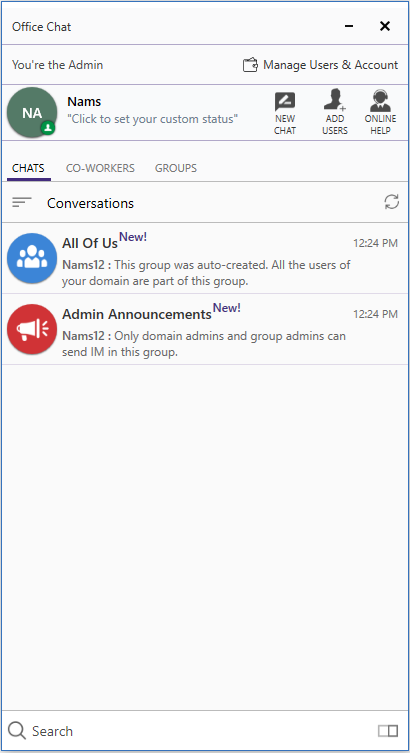 Backward compatibility: Older version clients that don’t support Admin Announcements Group feature in Office Chat 2.4, would now get an info message when a non-admin tries to send a message in the group.